The couple the diaper cake is for is from the country and they love everything about it which is why I decided to create a cowboy theme diaper cake for the baby shower! I thought it would be a perfect match for them! Each diaper is hand rolled and tied with ribbon then placed in a decorated cardboard box. When decorating the card board boxes, I tried to keep with the cowboy/country theme which is why I added a fence and rope around the bottom layer. As bad as this sounds, I used empty beer bottoms as pillars. I thought it was the perfect shape and fit with the theme. I wrapped each bottom with a thicker yarn. That same yarn is wrapped around the boxes of travel size baby care items sitting on the top. This diaper cake was for TWIN BOYS!!! I had to include 2 of everything. Two sets of travel size baby care. Yes, there are blankets!!! They are actually tucked up in the middle of the diapers. It is a great idea to use less diapers and include more baby items. Then of course I had to top it off with cowboy boots and a hat! 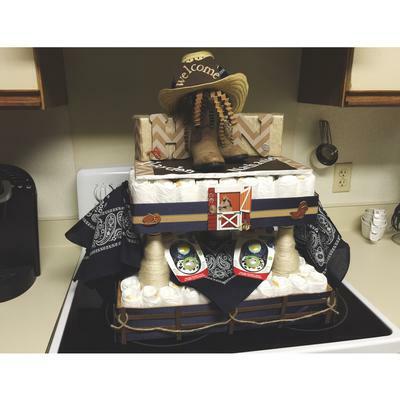 Comments for Cowboy Diaper Cake!!! Love this Jake! What a great idea for your friends. The "two of everything" was wonderful for these parents of twins to receive.